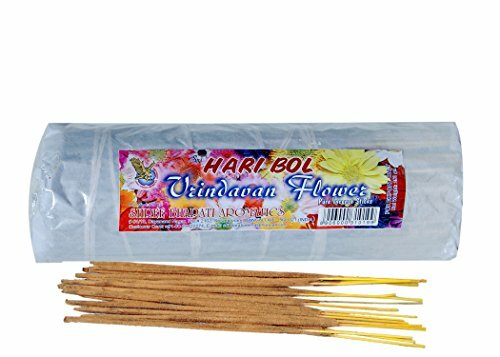 Sri Hari Bol Incense Sticks Divine Vrindavan Flower or Tulsi Agarbatti (Contain 200 incense Stick in each Packet) by Hari Bol Vrindavan Flower at Animal Backgrounds. MPN: VRINAGSA1214BL. Hurry! Limited time offer. Offer valid only while supplies last. Quality incense from Sri Hari Bol. The incense sticks are free from harmful chemicals. It can be used everywhere, even outdoors for a pleasant smell. Quality incense from Sri Hari Bol. The incense sticks are free from harmful chemicals. It can be used everywhere, even outdoors for a pleasant smell. Made in India. Weighs 9.5oz. Total Incense stick quantity is 200. it's being use in ISKCON temple in whole world. And as per our scripture where is available Tulsi or Vrinda then Supreme Personality Lord Hari/Krishna will be available that home or office. And you will get a peaceful home by Sri Sri Laxmi Devi and will get a good wealth. High Quality incense from Sri Hari Bol Vrindavan Flower Incense Stick. The incense sticks are free from harmful chemicals. It can be used everywhere, even outdoors for a pleasant smell. This pleasantest of scents lends a royal air to all that it spreads. It wouldn't take long to guess the source of this classy fragrance - Vrindavan Flower(Tulsi Flower) No other fragrance can equal the majestic trace it imparts on all who savor it. If we Worship from Tulsi flower or vrindavan Flower so all Demigod will being pleasant and you will get good health and wealth. And your home will be peaceful. A natural blend of Ayurveda herbs and aromatic botanical extracts.Free of animal testing and chemicals. Extracted from: The rich soulful traditions of India. If you have any questions about this product by Hari Bol Vrindavan Flower, contact us by completing and submitting the form below. If you are looking for a specif part number, please include it with your message.